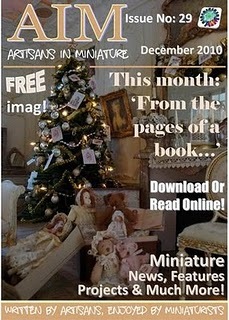 I am very honored to have "Life in Miniature" featured as the Blog of the Month in the December edition of the AIM magazine! Some of my miniature books were also included in a gallery of gorgeous miniature books from artists around the world. A big thank you to the editors of AIM! This month's theme is 'From the Pages of a Book...' and is a record-breaking 148 pages! Focusing on the love of books & literature and how they inspire our miniatures, this issue is full of stories come to life, from character dolls to nursery rhyme scenes to a miniature version of A Christmas Carol. And of course we can't forget Christmas - the Christmas gallery is full of beautiful miniature work, including Santa dolls, holiday rooms and scenes, Christmas trees, and scrumptious miniature holiday food. (Look for one of my Christmas trees and my miniature Elves!) Sara Scales gives us a brief history of traditional English Pantomime, and Jean Day takes a look at the beloved classic, The Night Before Christmas. For a Christmas "just like home" you don't want to miss Marianne Colijn's hilarious tutorial for Christmas Food Disasters - puddings stuck in molds, burned cookies, fallen soufflés, broken eggs and spilled jars, and lumpy mashed potatos! More free projects this month include 1:12-scale long johns, a pedestal cake, and seasonal brandy & cranberry sauces, as well as chocolate chip cookies in three scales and a 1:24-scale bookcase. Lee Ann Borgia also shares printies and instructions for making two beautiful Victorian children's books.